Finally I reached the last day of my journey. 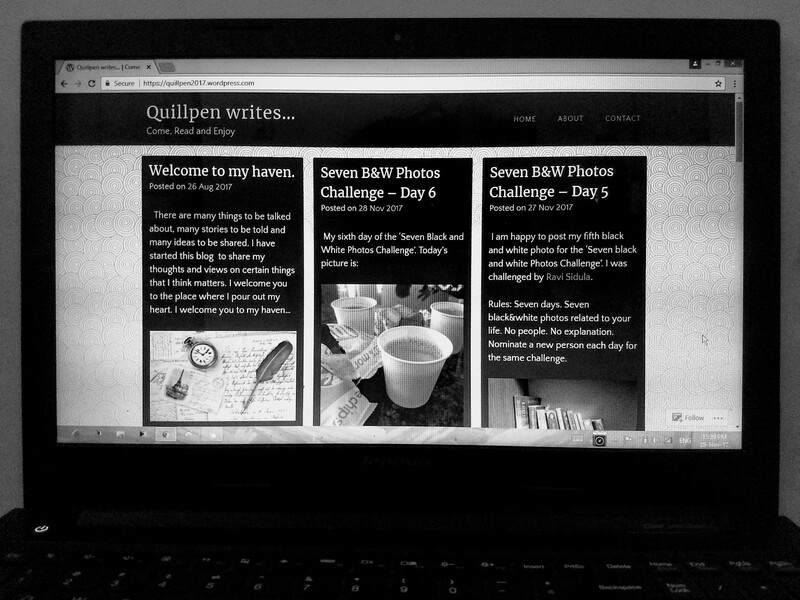 The seventh day of the ‘Seven Black and White Photos Challenge’. Once again thank you Ravi Sidula for letting me be a part of the challenge. I had quite an interesting experience, each day trying to explain a part of me through the captured pictures. It made me understand the beauty and power of photos. Black and white surely enhance a picture’s beauty irrespective of what it carries within its borders. Thank you all for liking and giving comments. In hindsight, I think this venture should be experienced by all, as each one of us deserves to discover ourself by having fun. So please feel free to take up the challenge yourself. I would like to place a fullstop to this journey with this black and white picture which I think defines me the best. As of this moment this is where my life and interests converge. Beautiful way of ending it. It was nice going thru ur journey of photos. Glad u enjoyed it. 😊 Thank you for those words. Have nominated you for ‘The Unique Blogger Award’!